The question about weighted blankets has come up recently on several web-loops I'm on. I wanted to share what my friend Beth sent me about making these blankets. She uses the pattern found at this site to make her blankets. Beth told me, "These are the easiest directions I could find, and the exact method I used, including using old flat sheets. I did add stuffing along the unweighted sides, where hers were empty, just for pretties." If you've never heard of weighted blankets, they are often used for people with sensory issues (such as Sensory Processing Disorder). 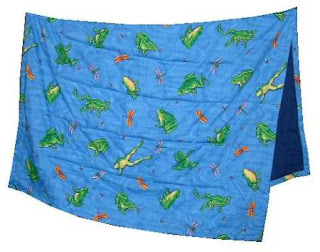 Many 2E kids love weighted blankets (or weighted stuffed animals) because they have trouble identifying with their bodies. Something about the extra sensory input helps calm them and their minds. One person equated it to being wrapped in a giant hug. Getting the right weight is important. Too heavy and it could hurt them and if it's too light, it won't have the desired effect. The rule of thumb is 10% of your child's body weight plus one pound. Some of you might not think your child needs a weighted blanket. However, we learned that if they tend to want a lot of covers or a lot of stuffed animals or pillows in their bed, they may be trying to create the 'weighted blanket' feel. Nathan has always wanted a blanket on to sleep and tons of stuffed animals. His favorite is a 2.5 foot long dog that he puts on top of his body. I haven't weighted the dog yet...but I'm thinking about it. Or he would put pillows on his legs. Another thing we found that helps with sleeping is creating a 'cave' for them. If you go to this post, you'll see Nathan in his bat-cave (he prefers Nathan-cave).